Acnes are a result of oil trapped beneath the skin which allows the bacteria to thrive in it. This occurs when dirt, dead skin cells and other toxins clog pores. It is extremely painful and also embarrassing. It is not always necessary to resort to expensive medication. Home remedies are extremely effective in curing the problem. Does Honey Work for Acne? How to Use Honey for Acne? Honey acts as an antiseptic and prevents the growth of any disease-causing organism. Honey releases some low-level hydrogen peroxide that helps disinfect the skin. The high sugar concentration and its acidic properties stop the replication of the bacteria. Honey is also an anti-inflammatory that prevents the swelling and redness that comes with acne. 3 tablespoons of diluted apple cider vinegar at 1:1 ratio. Wash your face with lukewarm water and pat it dry. Steam your face for 5 minutes. Apply the honey to your face and massage in small circles until the honey becomes sticky. Wash it with lukewarm water after 15 minutes. Using a cotton ball apply the apple cider vinegar on your face in upward strokes. Repeat 2 times regularly for best results. Benefit: Apple cider vinegar is anti bacterial in nature and being slightly acidic balances skin pH. Leave it to dry for 30 minutes. Wash your face with cool water and pat it dry. 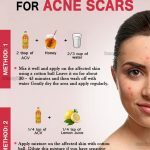 Repeat 2 times daily till acne are cured. Benefit: Lemon is a natural anti fungal and exfoliating agent which works faster on the acne. Mix the baking soda and honey into a smooth paste. Gently apply the mixture on the acne affected area using your fingers. Scrub the face gently in a circular motion for 5 to 10 minutes. 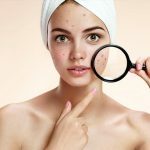 Repeat 2 times daily till acne are reduced. Benefit: Baking soda exfoliates dead skin. it is also anti-bacterial and anti-fungal in nature. Mix the 2 ingredients and make a smooth paste. Apply the mixture on the acne affected area and leave for 20 minutes. Repeat 3 times daily till the acnes are reduced. Benefit: It is a natural antiseptic and has healing properties. Crush the aspirin tablets into powder. Add honey and water to make a smooth paste. Apply the paste on the acne affected area and let it dry. Rinse off the paste after 15 minutes. Repeat 2 times regularly till the affected areas are healed. Benefit: Aspirin contains caffeine that helps to remove toxins from skin. 1 to 2 teaspoons of cinnamon powder. Ensure that the consistency is thick. Once the temperature has cooled a bit, apply it on the acne affected area. It can also be applied on the entire face if you wish. Leave the mask for 10 to 15 minutes. Benefit: Cinnamon has anti microbial properties that heal the acne faster along with honey. Mix the 3 ingredients till the oil s are well mixed with honey. Repeat 2 times daily till acnes are reduced. Benefit: Coconut oil hydrates and nourishes the skin easily from within. 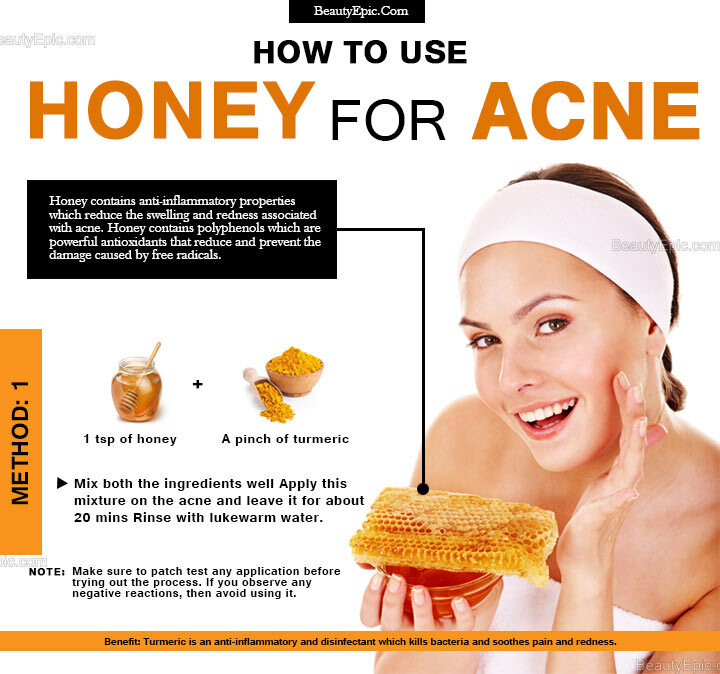 These are some of the common methods of getting rid of acne using honey. It is important to follow the instructions for best results. Consult a doctor in case you detect the growth of allergies while using the packs. How To Use Coconut Oil To Clear Your Acne?